During steel production, increased local hardening may occasionally occur on the surfaces of semi-finished products. In the further processing and later use of the finished products, this hardening (also called hard spots) can cause problems or lead to component failure. Because of this, relevant specifications increasingly call for surface hardness testing. Testing was previously only possible using „destructive“ methods (Vickers, Brinell, Rockwell) on samples or, non-destructively, using the Leeb rebound hardness test. For extensive surface testing of semi-finished products, these methods are however poor or unsuitable. For this purpose, Rohmann GmbH has developed a new test method (Eddy+ , patent pending) which can easily detect differences in hardness. A special sensor performs a partial reversing magnetization with a bipolar magnetisation pulse, while an eddy current sensor measures the associated permeability change. This method has the advantage of eliminating disturbing influences for a conventional eddy current test (caused by e.g. a rolling skin), while at the same time achieving very high test speeds of up to 1m/s. 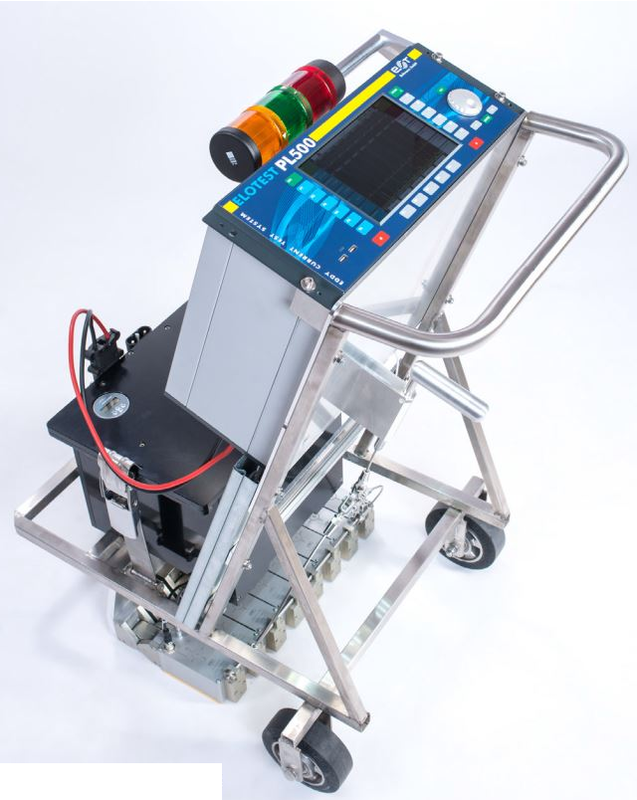 The ELOTEST HST trolley has been designed for the manual testing of large semi-finished flat products such as heavy plates with the Eddy+ method. It is modular in design and can be adapted to customer requirements. Test signals are shown on the corresponding device screen. In addition, the system status and possible exceedings of the pre-set evaluation threshold are indicated to the operator by means of a clearly visible „traffic light“. This means that the ELOTEST HST test system is predestined for use in harsh steelwork environments. An integrated battery solution makes the test system independent of the mains.